It is not easy to compete with the brand that has defined cool for decades. Zippo is arguably the most famous brand in lighters today. Could there be competition for cool that is also environmentally friendly? In this day and age, yes! Jigger USB lighters have hit the market ready to bring it with a unique renewable option. USB technology is once again “enlightened” with this duo innovation from Jigger, a brand that has become synonymous with USB lighters. Recently, Jigger introduced two models, USB Gadget Lighter and USB Prestige Lighter, a higher-end version of the USB Gadget Lighter. 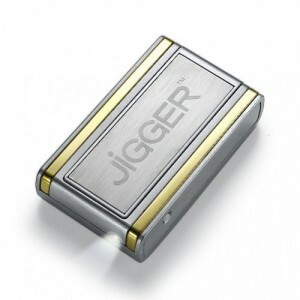 The most striking feature of the Jigger USB lighter is that it charges up with electric power from an outlet or a PC through USB connection. It stores the power and turns it into intense heat to light up just about anything a traditional lighter could. The process is similar to what happens to a car lighter, which does not (normally) produce a flame and smoke. There are more great features of the Jigger Prestige Lighter: it has a built-in flashlight, it is windproof, and it is safe to take on airplanes. The Jigger Gadget Lighter allows up to 250 lightings once fully charged while the Jigger Prestige allows up to 300 lightings. Now we can’t help but commend Jigger for these unique products; however, can anyone really say that it is practical budget-wise? The USB Gadget Lighter sells for $29.99 while the Prestige is sold for $49.99. Come to think of it, not even the gadget lighter, for the budget friendly, fits its price! But then again, it’s unique and environmentally friendly. If you are a smoker, it wouldn’t hurt to make an effort to buy something like this, would it? Do you think the benefits of using Jigger USB Lighters are worth it? Post your comments here! This entry was posted in Articles, USB Gadgets, USB Technology and tagged Jigger Flameless USB Lighters, USB gadget, USB Lighters, USB technology. Bookmark the permalink.